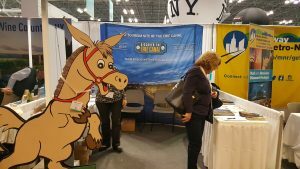 Canal NY once again exhibited at the NY Times Travel Show which was held on January 26th– 28th at the Jacob Javits Center in NYC. The show draws more than 10,000 visitors each year. 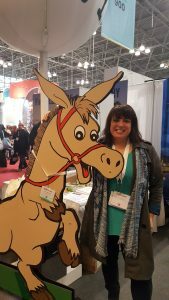 The attendees include consumers, travel, trade and media from both the NYC area and around the globe, with over 550 exhibitors representing more than 170 destinations. It’s a three-day event that includes educational seminars, celebrities and demonstrations-all geared to entice visitors to travel! Canal NY’s exhibit was located within the I Love NY aisle! The booth drew media, tour operators and individuals wanting to learn more about the canal and how to experience it. Many were fascinated that the canal is still in operation, wanted itineraries and information on our partners who exhibited at our booth. More than 2000 pieces of literature related to the Canal were handed out during the show. We want to thank our partners for whom without their financial support would not have allowed Canal NY to once again participate in the event. The New York State Canal Corporation, Visit Rochester, Mid-Lakes Navigation, Albany County Convention & Visitor’s Bureau and Cayuga, Orleans, Oswego, and Wayne Counties. Lori Solomon our marketing chair is already working on our presence for next year’s event!